It looks like this process may have changed in more recent updates as this thread is quite old now. If anyone could provide detailed steps on how to export/share a project with a different machine that would be very helpful. I want to be able to work on my home project on my work pc. Also any steps on how to use the preview version would also be handy. I have seen some references about importing a Preview version but have no idea how to go about this. The best is to use an online repository system like github or bitbucket, and then you can push and pull from any computers ( use source tree client app for ease). If you are not sharing this package, you can include everything, not problem, else indeed you need to remove the dll, they are inside the plugins folder. Do i also need to de-select the .dll.mdb file? Also, do you know much about using a Preview version of Playmaker? On machines which do not have a license? just the dll will be fine, but you simplu uncheck the whole PlayMaker Plugin folder. can i share the playmaker project without playmaker installed? here is the issue: i am working with playmaker, and i want to share the playmaker project to the other. but the other doesnt have playmaker installed, he works with scripts. can i convert playmaker project as script project to him so that he can use that? ps. he doesnt need to modify the playmaker project. Sorry but Playmaker can not be to scripts. Hi thank your for your reply. 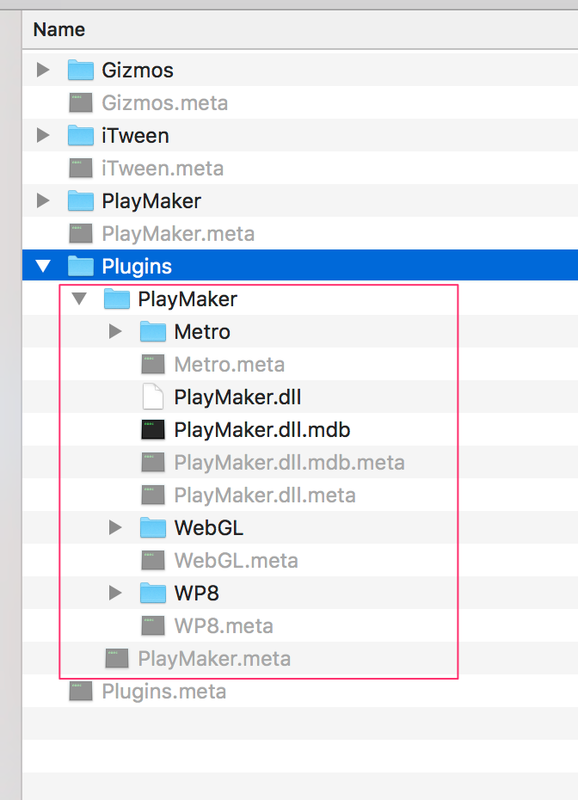 so if i work with playmaker, and the other works with scripts, the other should have playmaker installed firstly, so he can open my project and edit it in scripts, right? would you recommand that? would the performance be kind of worse with that? Yes, If your project uses PlayMaker, then it must be inside the Project Assets, regardless of who is working with it or if you work as a team. Performances are not affected, Projects can be a mix of PlayMaker and scripts, it's totally fine and actually recommanded and totally supported out of the box. You use PlayMaker as much or as little as you wish. Hello, i am begginer. I do not understand this post. If I want to publish my game on Steam, do I have to do what appears in this post? Thank you. No. This is just if you want to share the source project. I wanna share this project on Youtube. Now, before exporting unitypackagae, I have to delete Version folder & Install folder only right? No need to remove playmaker.dll & playmakereditor.dll right?